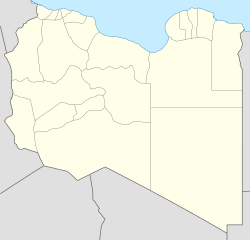 Nofaliya or Nawfaliya (Arabic: النوفلية‎ Nawfalīyah) is a town in the desert in the Sirte District of Libya. It is west of Libya's major oil ports. It is located in the former Bin Jawad District, around 20 km west of Bin Jawad and 15 km south east of ‘Uwayja. During World War II Nofaliya was the site of a brief skirmish in late 1942 when some of Erwin Rommel's retreating forces ran out of fuel. At the time it was home to a small fort with a few Italian buildings in addition to a mosque, some shops and a school. During the Second Libyan Civil War, Nofaliya was fought over by the New General National Congress forces (NGNC), the Islamic State of Iraq and the Levant (ISIL); the Libyan National Army (LNA) and various militias. In February 2015, the town was taken over by the ISIL. A convoy of forty heavily armed vehicles arrived from Sirte and ordered Nofaliya's residents to "repent" and pledge allegiance to Abu Bakr al-Baghdadi. The fighters appointed Ali Al-Qarqaa as "emir" of the town. Nofaliya was briefly retaken by New General National Congress forces on 19 March 2015, but they withdrew the next day. The LNA took the town, but ISIL regained the town from the LNA the following week. It was not until the Bunyan Marsous offensive in Spring of 2016 that pro-government forces retook the city on 31 May 2016. However, in December 2016 militia forces, believed to be units of the Benghazi Defence Brigades, attempted to take over Nofaliya, driving off the NGNC forces, but were in turn driven out the same day by the Libyan National Army (LNA). ^ "IS said to have taken another Libyan town". Times of Malta. 10 February 2015. Archived from the original on 12 February 2015. ^ "Pro-Tripoli forces retake Nawfaliya from ISIS, Al Jazeera". ANSAmed. 19 March 2015. Retrieved 19 April 2015. ^ Al-Misrati, Naima (20 March 2015). "Libyan army avances toward Tripoli - official". Kuwait News Agency (KUNA). (Subscription required (help)). ^ Westcott, Tom (28 March 2015). "Tripoli forces withdraw from battle for Libyan oil ports". Middle East Eye. ^ Ali, Abdullah Suleiman (31 March 2015). "Will IS benefit from Operation Decisive Storm?". Archived from the original on 3 April 2015. ^ "UN envoy calls for more unity in defeating Islamic State in Libya". Africanews. 31 May 2016. ^ "LNA retake Ben Jawad and Nufliya". Libya Herald. 7 December 2016. Archived from the original on 8 December 2016. This page was last edited on 25 June 2017, at 00:57 (UTC).